For many educators, encountering Shulmanʼs 1986 articulation of "pedagogical content knowledge" (PCK) brings an epiphany. It names something we are sure exists, and recognises that "there really is something special about what I know for teaching my discipline area". 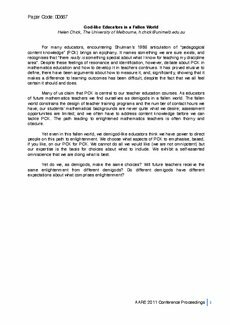 Despite these feelings of resonance and identification, however, debate about PCK in mathematics education and how to develop it in teachers continues. It has proved elusive to define, there have been arguments about how to measure it, and, significantly, showing that it makes a difference to learning outcomes has been difficult, despite the fact that we all feel certain it should and does. Many of us claim that PCK is central to our teacher education courses. As educators of future mathematics teachers we find ourselves as demigods in a fallen world. The fallen world constrains the design of teacher training programs and the number of contact hours we have; our studentsʼ mathematical backgrounds are never quite what we desire; assessment opportunities are limited; and we often have to address content knowledge before we can tackle PCK. The path leading to enlightened mathematics teachers is often thorny and obscure. Yet even in this fallen world, we demigod-like educators think we have power to direct people on this path to enlightenment. We choose what aspects of PCK to emphasise, based, if you like, on our PCK for PCK. We cannot do all we would like (we are not omnipotent) but our expertise is the basis for choices about what to include. We exhibit a self-asserted omniscience that we are doing what is best. Yet do we, as demigods, make the same choices? Will future teachers receive the same enlightenment from different demigods? Do different demigods have different expectations about what comprises enlightenment?